Summer is upon us!! The only way to enjoy the scorching heat of this season is by staying refreshed and cool all the time. And, how do we achieve that? 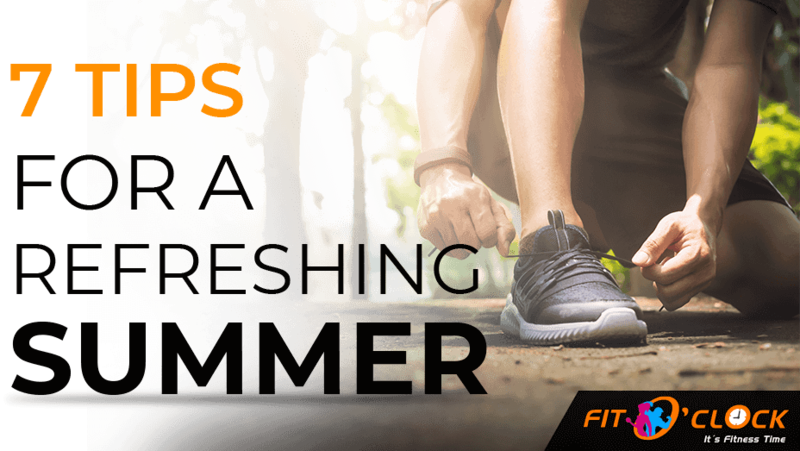 Well, these simple yet refreshing tips will help you beat the summer heat without any glitch. Take a look! Drink gallons of water! 8-10 glasses of water in a day is a must to keep going in this summer heat. You can even infuse your water with some herbs and flavors to infuse some healthy nutrients in it. Keep your water the way you want but keeping yourself hydrated is the key. Bring back the all-natural, loaded with nutrients and yummy coconut water in your diet. It is a must, especially if you workout. Raw coconut water can prove to be a healthy and effective post-workout drink. Summer is the season of fresh fruits and vegetables. So, hit the local market and get your hands on all these fresh and healthy treats. Berries, Watermelon, Grapes, Pineapple, Peach, Cucumber, Lemon and the list goes on. Eat the seasonal fruits and vegetables to keep yourself cool and to restore your body’s energy. Summers should never be an excuse to skip your exercise routine. It can be difficult to head out for a workout but you can always go to a Gym to keep up with your fitness regime. Make sure you go to your nearby gym and sweat it out as it balances your body temperature. There are several great Gyms in Jaipur that you can opt from. So, choose one and keep exercising! Walk in the grass, relax under a tree shade, dip your foot in the ocean, go trekking or do whatever that connects you with nature. It is probably the best way to refresh, rejuvenate and energize yourself. Doing this not only revive one’s senses but also boosts the immune system. Never compromise on your sleep if you do not want to end up feeling lazy and lethargic all the time. An 8-hour proper sleep is a must if you want to stay lively and energetic all day long. If you cannot devote these many hours, then try taking a power nap in the afternoon to get back your energy. Include more of antioxidants in your diet. They are not just amazing for your health but do wonders for your skin, as well. Grapes and berries are high in antioxidants followed by watermelon. Eat them raw or sip in those nutrients in the form of a juice. Purple cabbage is another good source of antioxidants which you can include in your diet. So, a refreshing and rejuvenating season awaits you. Have a happy and relaxing summer!! Note – With summer just around the corner, it won’t be surprising that you will get lazy (coz’ of the weather of course!) and prefer lying around during the holidays. Do yourself a favor and incorporate some exercise into your daily routine or simply hit the gym. Any chances, you’re from Jaipur? Try Fit O’ Clock. It is one of the best gym in Raja Park, Jaipur that offers gym-goers the pleasure of intense workout session with its high-end equipment and highly qualified fitness trainers.